Another topic that keeps returning on this blog is the expandable list view. It seems those troublesome expandable lists always have some surprises in store. 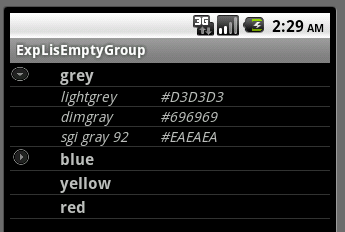 This time I ran into the issue of group indicators and empty groups. Group indicators are those small arrows in front of the group rows that indicate, whether the group is expanded or collapsed. Trouble is that those indicators are always visible, even if the group is empty. This misleads users who think that they can expand the group. The group indeed expands but as it is empty, no child rows appear which can be extremely annoying. Some internet sources propose wizardry with the variable drawable that backs the group indicator. If you follow the advice, the group indicator will disappear for all the collapsed groups (even for those which have child rows). This surprising behaviour is by design. Comment in the source of ExpandableListView says: "[if] the group is collapsed so we consider it empty for performance reasons". The method where this behaviour is wired in is private, it is not possible to overload it by subclassing ExpandableListView. Fortunately the solution is very simple, even if a bit tricky. We will completely disable the group indicator logic in ExpandableListView and provide our own indicator from the adapter backing the expandable list. The group indicator is disabled by setting it to a transparent color in main.xml. Then we override getGroupView in the adapter (this time it was a SimpleExpandableListAdapter but the method works for any adapter). We had to manually add an ImageView to the group layout - this is normally done automagically by ExpandableListView but we have just disabled that functionality. Once getGroupView returns the group row, we post-manipulate the ImageView that acts as group indicator considering the child count for the group beside its expanded/collapsed state. This unfortunately means that you have to have custom expanded/collapsed icons in your program - those icons are extremely ugly in the example program, I leave it to you as a homework to beautify them.